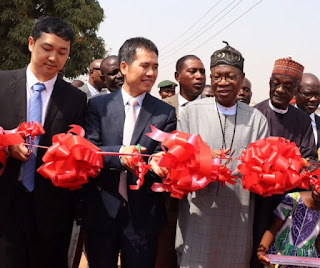 The Minister of Information and Culture, Alhaji Lai Mohammed, has launched the 1,000 Villages Satellite TV Project, which is part of the Chinese government-sponsored 'Access to Satellite TV for 10,000 African Villages Project'. “The 1,000 villages project could not have come at a better time. In just a little over one month, Nigerians will be voting in the 2019 general elections. They need access to information now, more than at any other time, to know about the over 70 political parties that will be participating in the elections as well as about their various candidates,” Mohammed said. Pix: The Minister of Information and Culture, Alhaji Lai Mohammed (second from right); The Chinese Ambassador to Nigeria, Dr. Zhou Pingjian (second from left); Chief Executive Officer of NTA-StarTimes, Mr. Justin Zhang (extreme left) and the Director General of NTA, Mallam Yakub Ibn Mohammed (extreme left), at the launch of the Access to Satellite TV for 1,000 villages in Nigeria in Kpaduma, FCT, on Monday.